The Lancia Stratos HF Zero first appearance was the 1970 TURIN motor show. 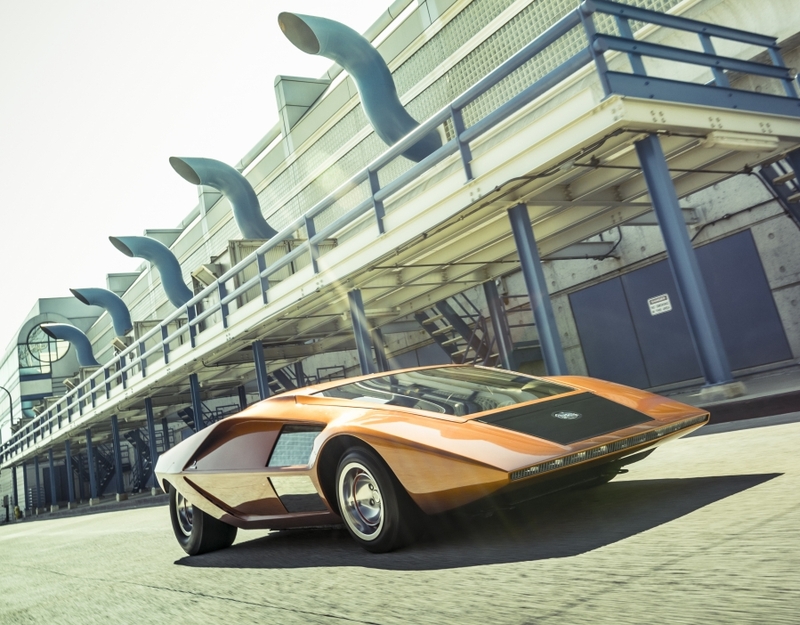 The initial concept behind the Zero was for Bertone’s people to see how low they could build a car. It may have been a response to Pininfarina’s Modulo, which stood at only 93.5 centimeters tall. The final version of the Stratos Zero peaked at just 84 centimeters ! Nor was the Zero was just a design concept; it was a fully functioning prototype. The futuristic design featured a row of headlights across the front with 55-watt bulbs. The turn signals were sequential, going from the center to the edges. The rear ribbon of lights consisted of a strip of 84 mini bulbs. The Zero was sourced from existing Lancia parts, according to former interior chief designer Eugenio Pagliano, and the 1.6-liter V4 engine was scooped from the Lancia Fulvia HF. It made 115 hp with two twin-choke Solex carburetors. The chassis was crafted in house, and the double-wishbone setup at the rear came from the front end of a crashed Fulvia. Disc brakes were installed at all four corners and an 11.8-gallon gasoline tank was installed on the right side of the engine bay. The triangle engine cover directed air toward the radiator, which was set in the rear. The seats were near horizontal and as close to the ground as possible. The windshield extended overhead giving what’s claimed to be a great view of the road in front and the sky above. The futuristic instrument panel was offset to the left and displayed info in green acrylic glass. Later, when Nuccio Bertone went to meet Lancia execs to talk about a more realistic sportscar project, he drove the Zero. Legend has it that he slipped right under the entrance gates with the low-slung sports car. That meeting eventually led to the Stratos Stradale. The Stratos Zero got a full restoration in 2000 at Bertone’s studio. It returned to its original bronze color, which was changed to silver shortly after its debut in 1970. The car was auctioned off from Bertone in 2011 at The Concorso d’Eleganza Villa d’Este to Thomas Mao. It has been on long-term loan to the Indianapolis Museum of Art until it was acquired by Phillip Sarofim in 2018.
independent rear suspension with double-wishbones and telescopic dampers, four-wheel disc brakes.